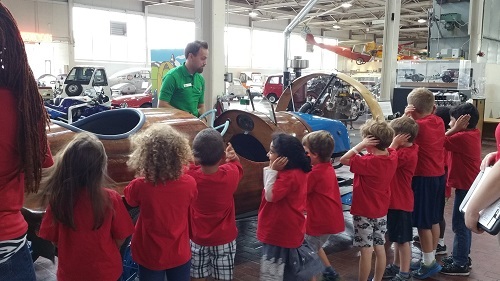 Fasten your seatbelts... at Lane Motor Museum, you're in the fast lane to learn! Our unique collection is a vehicle that crosses curriculum boundaries. Your ride includes stops around the globe with lessons in art, engineering, design, history, politics, mathematics, and language. There is no subject bigger than our LARC, the largest vehicle ever driven on the streets of Nashville, TN. or smaller than our Peel P-50, world record holder for the smallest car ever to go into production. At Lane Motor Museum, we use our collection items as tangible teaching tools! Lane Motor Museum offers the following education programs- click each program title for more information. Geared towards ages 3-5, the Lil' Learning Lane meets at the museum the 4th Thursday of every month from 10:30-11:30 AM. Registration is required.